Once Upon a Time is in its third season on ABC, and audiences are enchanted. I review the series for IGN so I haven't missed an episode. It certainly has ups and downs, but I like the overall concept of fairy tale characters living in our world. 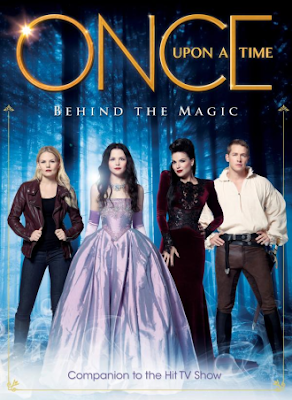 Once Upon a Time - Behind the Magic is the companion book for seasons one and two, and it provides plenty of behind the scenes pictures and information. You'll find interviews with the cast - including Ginnifer Goodwin, Robert Carlyle, and Colin O'Donoghue - that offer insight on how they got the roles, how they feel about fairy tales, and what it's like to portray characters from such familiar stories. They were fun to read, but my favorite part was getting details on the nuts and bolts of the series. Costumes, props, locations - all of these are huge parts of the world of Once Upon a Time. The scenes set in the fairy tale realm have their own looks and designs, and characters have to be balanced between there and Storybrooke. It adds a fascinating layer to costuming, and I loved seeing the sketches and learning how they put outfits together. Same with the props! It was a blast to see the mundane items some of the props come from and equally neat to see how many artisans they involve to create perfect on screen prop. I'd actually enjoy a whole book just discussing those aspects. There's a chunk about the VFX, too, and it's interesting to see what they do with green screens and digital creations. Unforunately, if you've watched the series, you know the green screen backgrounds are mostly ineffective. Finally, the book has a run down of synopses for all the episodes in seasons one and two. As a reviewer, that's helpful for me to refresh my memory about key plot points. Overall, this is a fun book that any fan of Once Upon a Time will enjoy flipping through. It's filled with beautiful, glossy photos and just the right amount of insider info - you need to maintain some magic after all. Get a copy of Once Upon a Time - Behind the Magic on Amazon. Note: This book was provided to me free of charge for review purposes. I love this TV series and this book is a must have. Did not expect it to be so choke full of colored stills and insights into the actors, the characters and heaps of behind the scenes (i.e. the special effects, the costumes, and a full synopsis of all episodes in seasons 1 and 2). From what I have read, this is a reprint of the Once Upon A Time magazine, and since I did not get them, I am pleased they released it in this format. Highly recommended for ardent fans. If you are following a collection in a details channel from other countries, Apps like Mobdro however do not fret. All you must do is to allow the 'Unidentified Sources'. Your variation of android is compatible with the most recent shop version. Enable Google Play Store on your Chromebook You could download it on your tool or your computer. The brand-new version from below. In addition, if you have any tweakboxx This guide will make you conscious about how you can download and install.